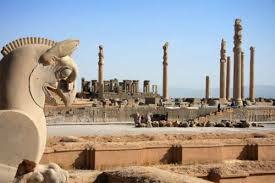 The first capital of the Iranian tribes and the Achaemenian Empire, Pasargadae is situated between the present-day Marvdasht and SaadatShahr 130 km to the northeast of Shiraz, not far from EsfahanShiraz road and less than 50 km from Persepolis. The nearby village is called Madar-e Suleiman (The Mother of Solomon) in much the same legendary ways as Persepolis is known as Takht-e Jamshid (The Throne of Jamshid). But there is no mythology about Cyrus the Great (550-530 BC) and his son Cambyses II (530-521 BC) who created the military encampment and associated buildings that the visitor now sees, with a clear influence of the Mesopotamian ziggurat. By starting from Shiraz early in the morning, all the separate sites can be seen with much haste in one day. Chronologically it is preferable to visit Pasargadae first, and travelers coming by road from Tehran will automatically do so. Those approaching from Shiraz, with only one day to spare, should go straight to Persepolis and photographers should make for the bas-reliefs on the east wall of the Apadana, then stop at Naqsh-e Rostam, spend the rest of the morning at Pasargadae and return to Persepolis to see Naqsh-e Rajab between 2.30 and 3 p.m. for the best light, then completing the tour of Persepolis. Cyrus defeated his overlord and grandfather, King Astyages on this field in 550 BC and decided to make his headquarters here. There is a building here which is generally agreed that it is the tomb of Cyrus, built (546 BC) during his lifetime. This 12-m high imposing stepped tomb of Cyrus, symbolizing in its somber linearity the simplicity and greatness that made the man a potential world conqueror, dominates Pasargadae as the Builder deserves. It consists of a small chamber borne by a basement of six courses which diminish upwards, so as to form steps. The tomb is entirely built of megalithic stone. Originally the Magi, guardians of Cyrus tomb, lived within the surrounding gardens in a separate dwelling. The interior of the mausoleum was richly furnishedthe embalmed body of the king lay in a golden sarcophagus on a gold couch, with a gold table by its side, on which various treasures were laid. Alexander the Great made several pilgrimages to the tomb, the last after it had been despoiled during his absence in India. Various classical writers mention an inscription on the tomb, no trace of which remains. According to Strabo this read: ―O man, I am Cyrus who founded the Empire of the Persians and was king of Asia. Grudge me therefore not this monument.― In ancient times it was surrounded by a portico, some bases of which can still be seen. The massive monolithic door of the buried chamber (now missing) could only be opened from the inside but the ingenious robbers had prized up a stone at the threshold and wriggled underneath the door. The contents of this tomb which Alexander visited were looted during the disorders which followed the latter‘s departure for Bactriana and India, in spite of a permanent guard of magi, who received a sheep daily and a horse Palace on the left, and ending in the Audience Hall. Both palaces were surrounded by protective walls until 1971 and are built on the oblong plan in contrast to the later, square plan of the Persepolis palaces. Only one tapered column of the original eight stands in place in the lofty central hall of the Audience Palace, a stork‘s nest in permanent occupation on its top. Originally double-horned lion promotes formed the capitals. Four low-ceiling porticos were also supported by columns, 48 supporting the northern colonnade. On the doorways of Palaces bas-reliefs of partly Assyrian inspiration can be seen, while on the 23 southeast corner a stone shaft bears a cuneiform inscription in Old Persian, Elamite and Babylonian, reading ‖ I Cyrus, the King, the Achaemenian‖ (built this). According to the latest conclusions of Mr. David Stronach, Director of the British Institute of Persian Studies, who carried out his excavations from 1961 to 1963, the strangely asymmetrical plan of the Residential Palace, and the inferior quality of the western portico, can both be attributed to the fact the Cyrus never finished the monument and that Darius, whose main building interests lay elsewhere, was not interested in completing the whole of the concept. Traces have been found of red, white, and blue plaster that was apparently used to cover wooden columns in some part of the structure. From this palace a footpath on the original Achaemenid road leads north to the remains of the socalled Zendan-e Suleiman (Solomon‘s Prison), of which the KabeZardusht in Naqsh-e Rostam is better-preserved replica. A little to the northeast again you reach a large stone platform on a hill known as the Takht-e Madar-e Soleyman(Throne of the Mother of Solomon), which is fitted without mortar but with metal clamps, mostly now stolen. Latest excavations have revealed imposing stone staircases on the northern side of the platform and four distinct phases of occupation. At the western end of an enclosure, after crossing a brook, one sees the two freestanding limestone plinths. The southern plinth has a flight of steps to its summit. These have been variously described as twin fire altar supports and as altars to Anahita and Ahura Mazda. A detailed survey and excavation in 1963 revealed the fact that the limestone additions originally embellished the white stone plinths; the northern plinth apparently never had a staircase and it may well be that, as in the scene depicted at Naqsh-e Rostam, the king mounted the steps of the southern plinth in order to worship before the sacred fire placed on the adjoining block. Pasargadae is open from 7:30 a.m. to 6 p.m. every day, but it is better not to arrive later than about 3 p.m. in winter (it gets surprisingly cold and windswept soon afterwards) or 4 p.m. in other seasons, and it is difficult to get transport out after dark. Unless you arrive here by private transport, you will have to walk between the remains.